2nd Edition, Revised and Expanded! 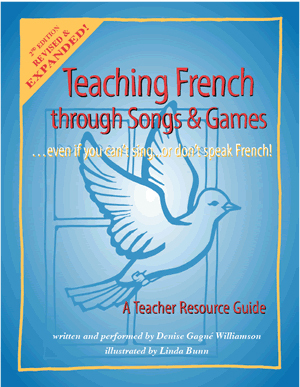 Teach French through Songs & Games is also available for instant download! Save over 60% & receive your copy today! Teaching French through Songs & Games …even if you can't sing …or don't speak French! Add interest and variety to your FSL or Immersion Program! Motivate even your most reluctant learners! Create the environment that encourages students to use their French vocabulary--regardless of skill level! activity sheets to reinforce language learning. and save $2.00 of the regular retail price! Denise Gagné Williamson has a BA in Theatre and Music from Université du Québec à Montréal, and a graduate diploma in Early Childhood Education from the University of Calgary. She has seventeen years of teaching experience in elementary French Immersion schools as a Kindergarten or Music teacher, and as a homeroom teacher of Grades One, Three and Five. Denise has firsthand knowledge of how much easier it is for students to learn a second language when vocabulary is presented in song and rhyme. She believes in the experience of pure joy made possible by singing and presently operates a private practice teaching voice to teens and adults. Linda Bunn has been both a commercial and fine artist. Having completed a diploma in graphic and visual design, Linda's first professional work was in the field of advertising. Following a period of travel and inspiration in Europe, Linda returned to Canada and studied fine arts at the University of Waterloo. Upon graduation, she married and started a family. Her first child was followed by twins and art quickly became a part-time activity. After thirty-five murals in children's rooms and an illustrated children's book (Moon Canoe), her children are now of an age where Linda has more time to paint on canvas and pursue freelance illustration contracts. Teaching French through Songs and Games is the second time her work has been included in a book.